We have been main Husqvarna dealers for over 20 years. We stock a wide range of Husqvarna products. We have recently become dealers for Hyundai Power Equipment and now offer a range of Petrol and Diesel Generators and Petrol Pressure Washers. View the listings that we have on our Ebay page. New Toppers, 6ft and 5ft Link Boxes, PTO driven post hole borer, Karcher Power washers, Log Splitters as well as much more. For the very best in farm equipment garden machinery and agricultural services, call J and J Farm Services. We have developed and excellent reputation over the years for top-quality equipment and customer service, and all our products come fully guaranteed. We are happy to carry out all your servicing and repair needs whether you are a Commercial or Domestic Gardener. Repairs to Forestry equipment also carried out. Here at J and J Farm Services, we fully understand the concept of client satisfaction. 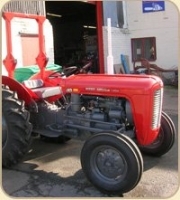 We are also happy to carry out restoration work on vintage Tractors or can assist with the tracking down of genuine parts to assist your restoration project. Please get in touch via the details on our contact page and see what we can do for you.